This process art project was SO. MUCH. FUN. 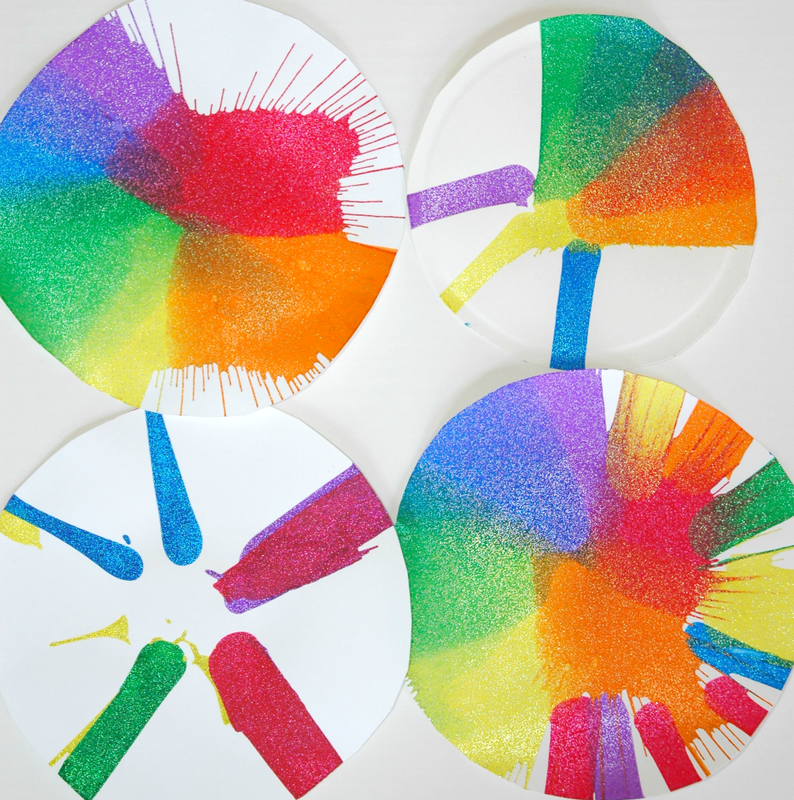 Rainbow Spin Art is an awesome way to explore the colors of the rainbow, make a beautiful project, and try a new painting technique. The results were bright, colorful, and sparkly, but the best parts were the giggles and squeals from my girls (aged almost 3 and 4.5) as we took off the lid each time to see what they'd done! We completed this project as part of our Colors and Rainbows Weekly Home Preschool Theme which includes picture books, science, learning activities & crafts, gross motor activities, and fine motor activities. To see ALL of our completed preschool theme weeks (OVER 30! ), you can check out this resource page. Start by getting your paper ready. Either cut the frills off your paper plates or cut the cardstock into circles that will fit in the basket of your salad spinner. Coffee filters would also work nicely. Put a piece of paper in the bottom of the basket and add some paint. 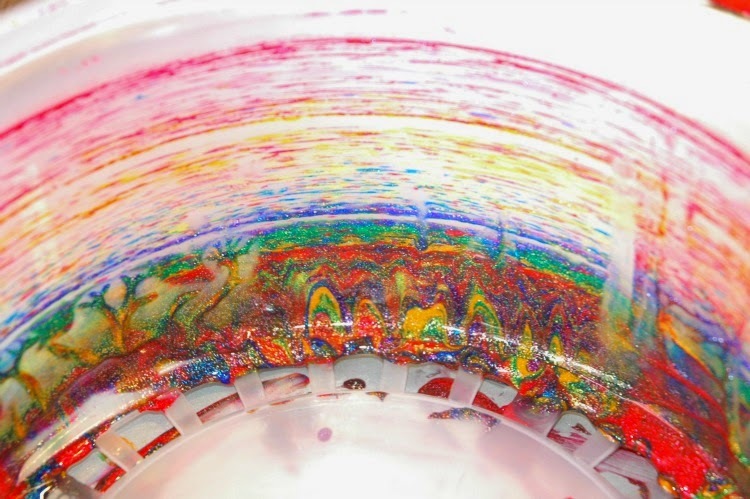 You can pour directly from the bottle or use an eye-dropper if your paint is thin enough (you can try thinning the paint with water if necessary). 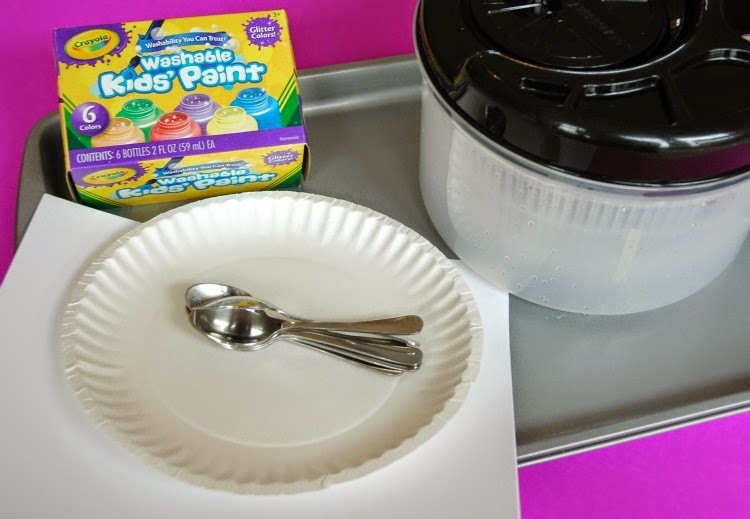 I was afraid to hand over a bottle of paint to my kids (who have not-terribly-refined pouring abilities), so what ended up working best for us was to use spoons. I poured a reasonable amount of paint onto a spoon and then let them drizzle it on the paper. 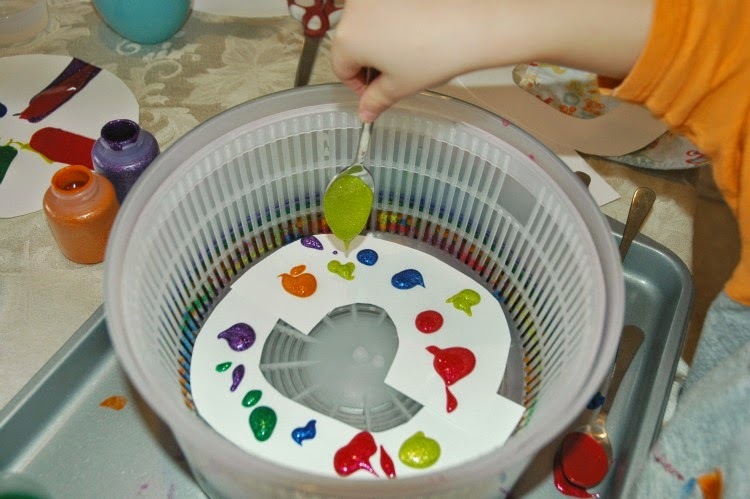 Once you've added some paint, simply put the lid on the salad spinner and spin away! I made sure to hold it steady (AND hold a camera-- aren't I fancy?). MY salad spinner has holes in the bottom (I guess you're supposed to use it in a sink?) so the baking tray underneath was critical for us! I'm not sure if all salad spinners are made the same way, but you don't want paint oozing out the bottom onto your table! 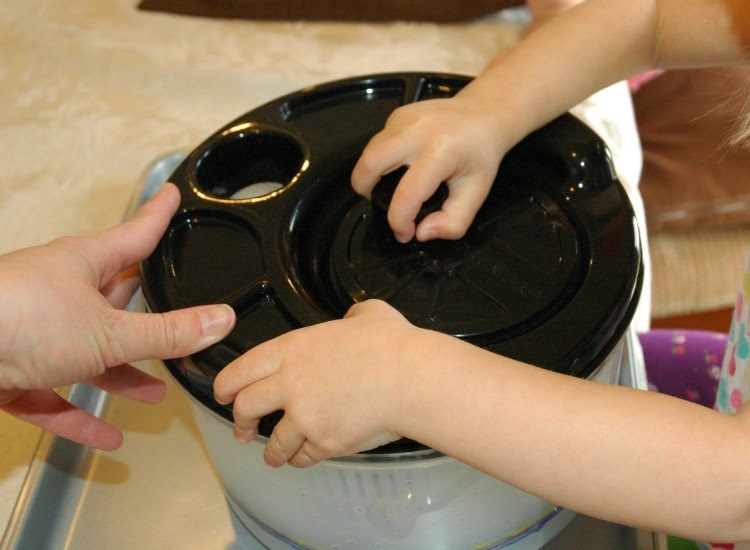 Let your kids experiment. We spun some papers 2 or 3 times, adding more paint in different places each time. Spin it fast and spin it slow. Use more paint and less paint. Put the paint towards the middle or out to the side. 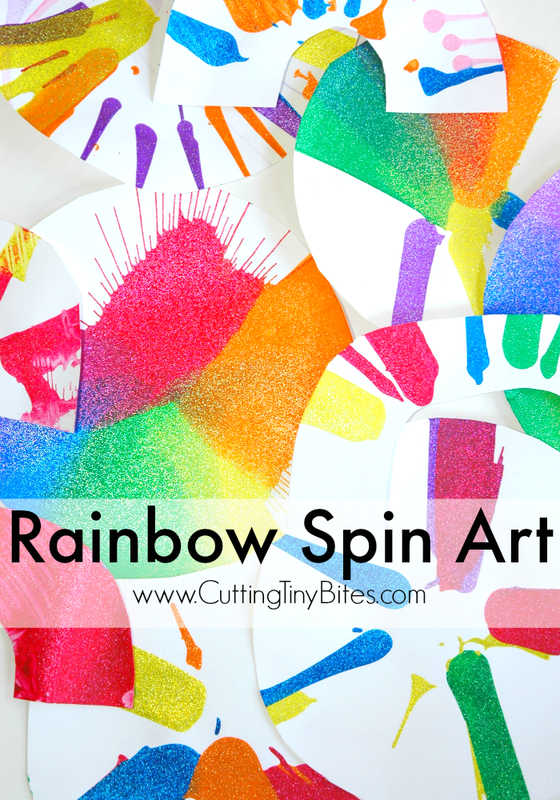 Since this was rainbow spin art, I cut a few papers into rainbow shapes and let them paint those! As you can see, this method of painting is not "mess free" as some people may try to tell you! But that's not to say that the mess is unmanageable, or isn't worth the effort. It was totally manageable AND worth the effort, but it wasn't exactly clean and tidy. 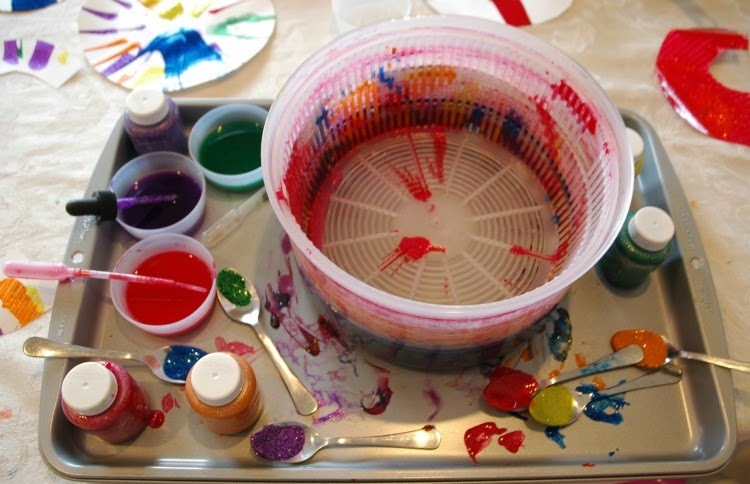 Just follow these tips about messy play and you'll be fine! It was just too beautiful to waste, and I wanted to capture all that paint! 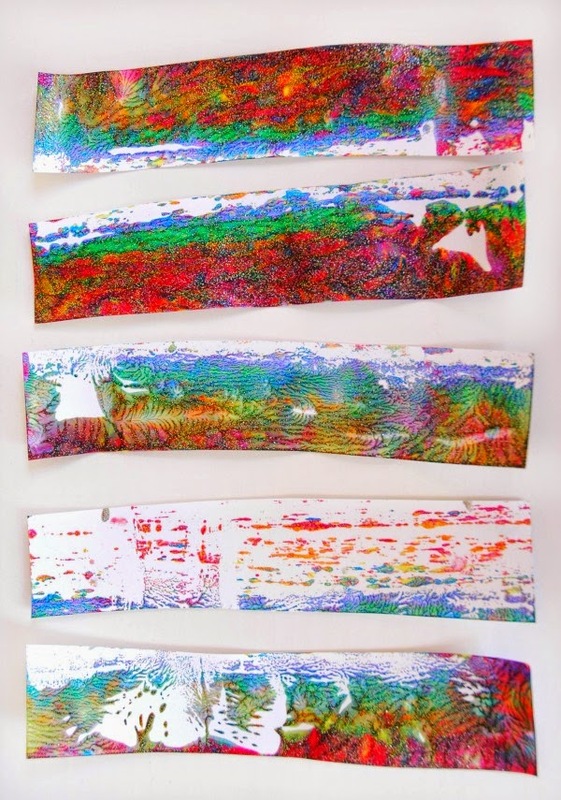 I cut thin strips of paper and made prints from all this extra swirly paint. After they're laminated, they'll make beautiful bookmarks, don't you think? My girls loved this project. The patiently took turns, ooh-ed and aah-ed as we took the lid off each time to see what the paintings looked like, and wanted to do more and more. For more BRIGHT and COLORFUL rainbow ideas, visit the What Can We Do With Paper And Glue Pinterest board below! This post is part of a great Painting Challenge over at Messy Little Monster. 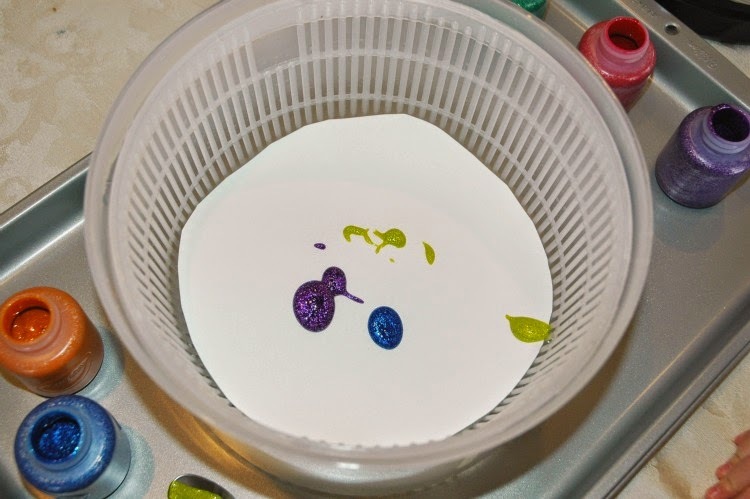 Each day this month you can check out a new painting technique to try with your kiddos! 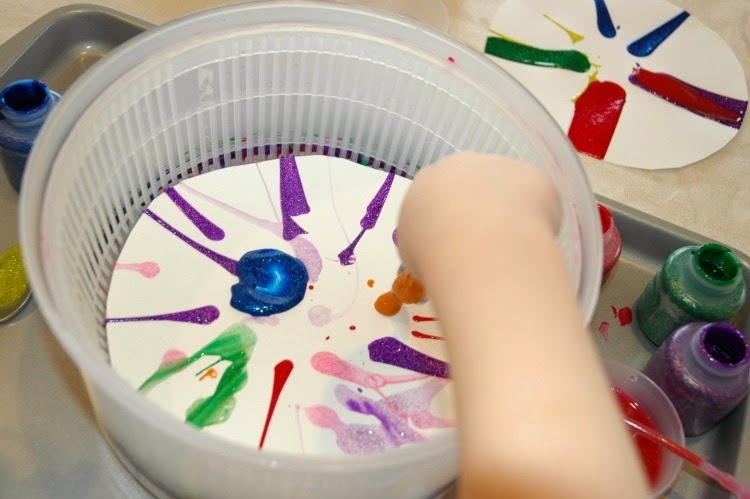 Rainbow Spin Art- fun process art craft for toddlers, preschoolers, or older kids. Bright and colorful!